The Box filter or running mean is a smoothing filter. It is not isotropic and can produce artifacts, when applied repeatedly to the same data. By default the Box kernel uses the linear_interp discretization mode, which allows non-shifting, even-sized kernels. This is achieved by weighting the edge pixels with 1/2. 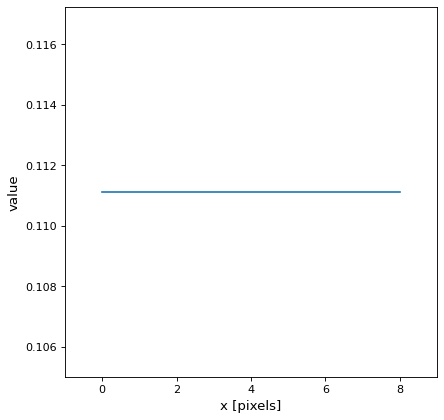 E.g a Box kernel with an effective smoothing of 4 pixel would have the following array: [0.5, 1, 1, 1, 0.5]. Width of the filter kernel. Discretize model by linearly interpolating between the values at the corners of the bin.